After all of these years and all of the recipes, one dish meals still are (and probably always will be) my very favorite. This one actually uses a skillet first to pre-cook the veggies and get some golden brown color on the chicken. But the rest of the magic is done ALL in the oven- in one big casserole dish. 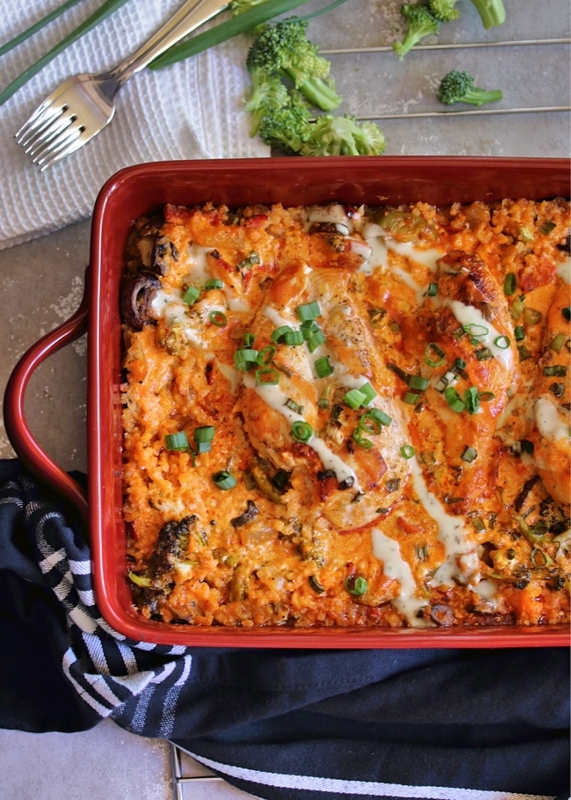 Combine the whole one dish meal thing with a creamy, Whole30 compliant buffalo sauce and tons of veggies!? 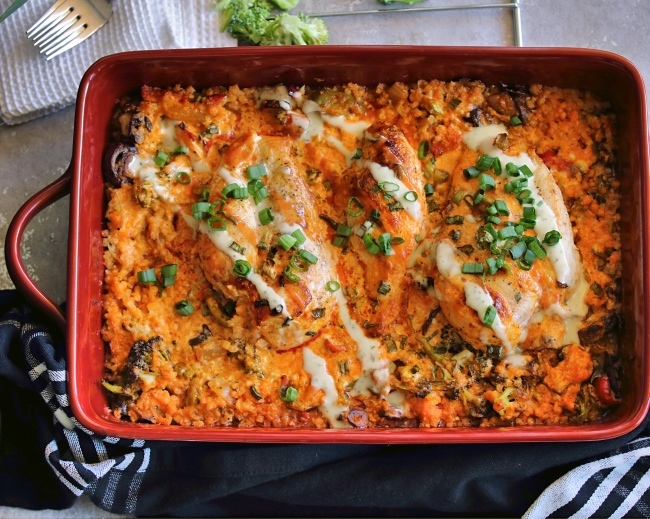 This is an all-in-one meal that I'm already dying to make again! What do you feel heats your house up more- cooking on the stovetop or in the oven? I feel like it's got to be the stovetop for us. Especially when it comes to grilling meats or doing something that takes a higher heat & a longer cook time. Our kitchen & family room are really open (like one big "great room") so the whole place heats right up. Oven meals are a go-to for us in the summertime for this reason, but we've also been itching to take things outdoors with a barbecue. So this weekend- we finally took the plunge and purchased a grill! My husband did lots of researching & comparing online before we went in store, and we ended up getting something super similar to what my parents have since it's what we know! They use theirs almost daily and love it, so if it's good enough for them- it's got to be good enough for the two of us! The hard part is being patient as we wait for it to be delivered (early next week). But once it's here you can bet we'll be firing it up right away- and ALL the grill recipes will be popping up here on the blog! I've already got skewers & pineapple pork chops on the brain, and seriously cannot wait! 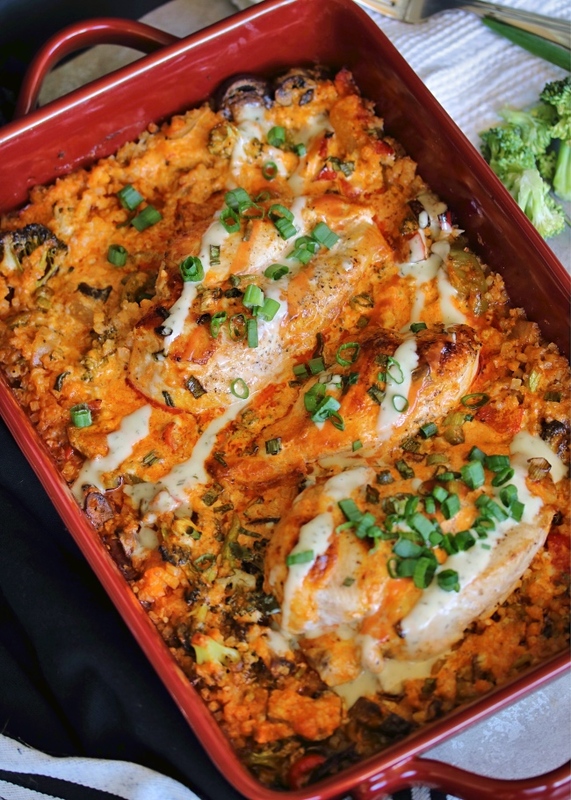 In the meantime, I'm all about the one dish meals (per usual) and know you guys are going to love this one! 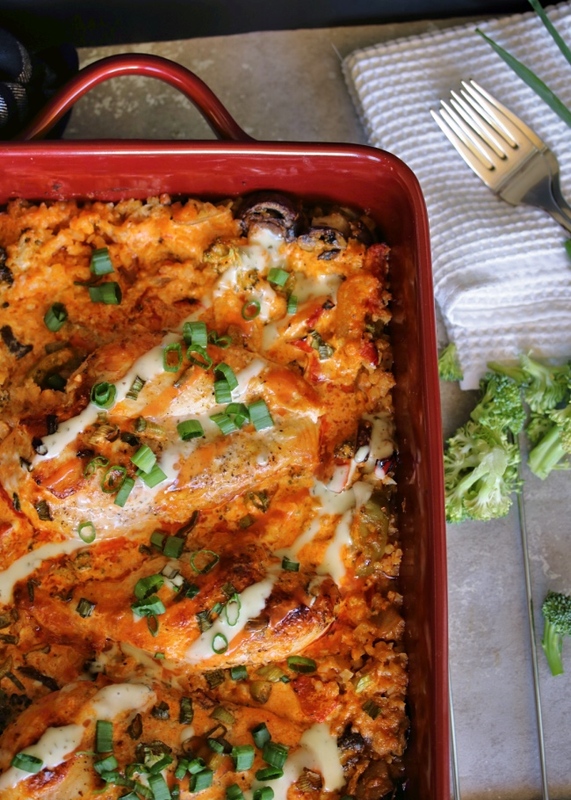 When creamy buffalo chicken meets tons of veggies and tastes mouthwateringly delicious? You can't go wrong! I hope you guys love this one. 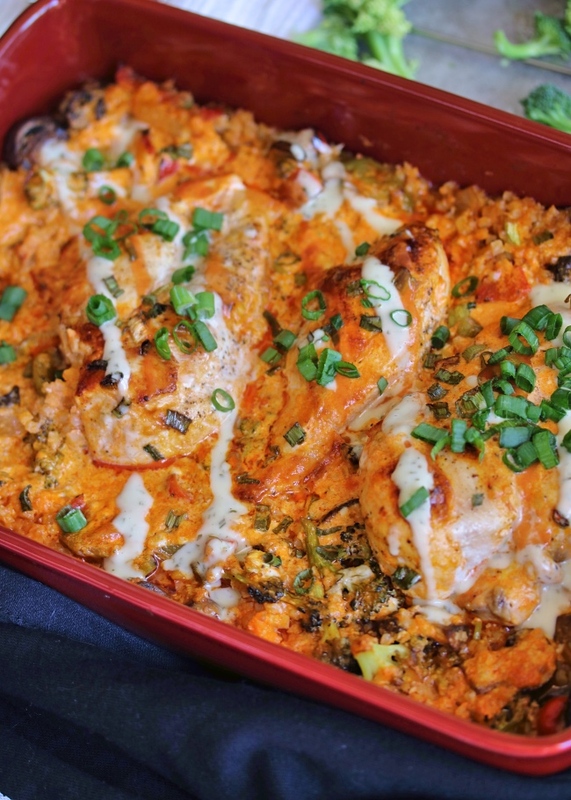 It's actually delicious served as a cold leftover lunch too- so perfect for meal prep! Enjoy!! Preheat the oven to 375ºF. Grease a large 9 x 13" baking dish with avocado oil or ghee and set aside. Melt 1 Tbsp of ghee in a large skillet over medium high heat. Season the chicken breasts with salt & pepper on both sides, then add them to the skillet. Cook the breasts for a few minutes per side until browned (don't worry about cooking them through), and set them aside on a plate. Melt an additional Tbsp of ghee in the skillet, and add the vegetables (broccoli, mushrooms, peppers, onion, and garlic). Sauté until tender crisp, about 5 minutes (they don't need to be fully softened). Stir in the cauliflower rice, and remove the veggies from the heat. Transfer the mixture to the greased baking dish, and layer the chicken breasts over top. In a small mixing bowl, combine the buffalo sauce ingredients: mayo, buffalo sauce, coconut milk, and spices. Pour the sauce over top of the chicken and vegetables. Transfer the dish to the oven, and bake for 45 minutes or until the chicken is cooked through and the sauce is bubbly around the edges. Serve hot! To make things a bit more quick & easy, I've substituted a bag of frozen fire roasted peppers & onions in place of the bell pepper and white onion. I also use a bag of frozen cauliflower rice to keep it simple! Look for a good quality mayo with compliant ingredients if you are making this on a Whole30. I love the one from Primal Kitchen! This looks amazing! Love the combo - can't wait to make this! I finally made this dish yesterday - and it did not disappoint. Even after changing up the proportions on the dressing (since I didn't realize I was running out of some of the items) it still tasted amazing. I ended up switching out some of the veggies for different ones, and worked out great. This is definitely in my recipe rotation now. Sounds delicious! If you use frozen veggies do you still heat them in the pan with the other veggies before putting in the oven? Is there any good substitute for mayo? i really really dont it and can taste it in recipes. I loved this. 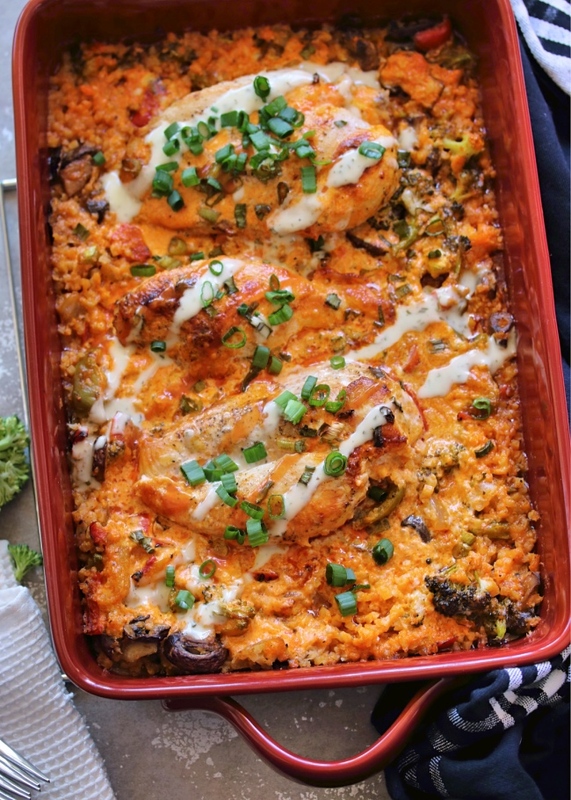 It is definitely going on our weekly rotation..
Making it now to bake tomorrow for dinner. Looking forward to trying it! Would you reduce the cook time at all if using tenders vs breasts? do you have nutritional information and number of servings this dish produces? Do you have any nutritional/macro information you can share?